All great advice books have a certain agelessness. While their subject is defined by their time, they share common themes and ancient wisdom. Placed in a different time and place, they could have been written by Aristotle, Plato, Montaigne, Thoreau or by modern authors Dale Carnegie, Stephen Covey or Jim Collins. A new addition to the library of timeless advice is Randal Moss and David Neff's The Future of Nonprofits. This book examines how the future of innovation, internal entrepreneurship, fundraising and social media communications that will radically change nonprofits in five years. They also provide a blueprint for how nonprofits can change and prosper in such a radically new environment. Change is inevitable. Nonprofits not only need to change, but they need to anticipate what that change will be. This requires a whole different worldview for nonprofits, which are generally conservative and backward. The good news is that being a nonprofit that anticipates change doesn't require a Ghandi-like leader or a Harvard MBA. We all have the ability to reflect on the future and see what's next. But it requires effort and discipline. Nonprofits need a new mindset and better habits, not a fortune teller. It's within this context that the two authors tee-up social media, one of the biggest change agents of recent memory and the focus of their book. Bottom-line innovation is key. Innovation is important for every industry, including nonprofits. But it shouldn't be confused with unnovation, a term the authors borrow from Harvard Business Review blogger Umair Haque, to describe innovations that don't really contribute to the bottom line. While such innovations may be useful to the nonprofit, they don't drive success and can actually be harmful as they take your attention away from the things that truly matter. But the authors draw an important line even here. Although you may be able to identify an important, bottom-line innovation for your organization, it is only truly innovative if it can be achieved. Good ideas are one thing. Good ideas that can be executed are a different breed. I often see this with cause marketing in many organizations. While it can represent a key innovation to may nonprofits and has significant financial rewards, there's no will or drive in the nonprofit to realize its potential and see this innovation achieved. If you think you can, you're right. If you think you can't, you're right too. Innovation begins with awareness. This section of David and Randal's book could have been summarized by Thoreau: "Only that day dawns to which we are awake." Nonprofits must begin by awakening inside and examining themselves first. How is your organization promoting itself? What channels are you using? What are the results (i. e. real innovation)? Only when you can answer these key questions can you truly understand and address competitors. But most nonprofits are insular and unaware. The authors offer a number of great resources in Chapter 5 to break the bubble in which many nonprofits exist and to encourage competitive collaboration. The Future of Nonprofits is one of those books that will you make you feel better about the direction your nonprofit is headed because it lays out a map to achieve innovation and sustainable change. Reading it, I never despaired that nonprofit were a in a hopeless situation, nor did I feel overwhelmed that David and Randal were proposing too much too fast. What I did feel was that I was reading something that was true, achievable and applicable to any nonprofit. So many people have so much advice for nonprofits it's difficult to decide who to listen to. Start with David and Randall as they are looking into a not-so-distant future that you can't afford to miss. You'll conclude as I did that this nonprofit advice book is the best you've read in a long, long time. A couple weeks ago I wrote about the lack of online cause marketing solutions. Since then, a number of people have contacted me saying, "Yes, Joe, there are online cause marketing solutions! Please blog about them." One of these people was David Neff, COO at Help Attack!. As David explained, the premise behind Help Attack! is simple. Just as cause marketing was created to allow consumers to donate to good causes via their favorite businesses, Help Attack! allows online users to support causes via their social activities. 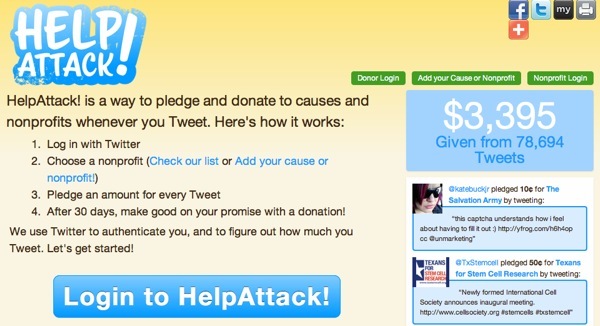 Here's how Help Attack! works. You login to Facebook or Twitter. Choose a nonprofit or add your own. At the end of the month you honor your pledges with a credit card. David had to be patient with me as I had trouble grasping that you didn't have to tag your tweets or wall posts to make a pledge. That's how most of these programs work, like the McDonald's promotion I blogged about last week that tied donations to mentions of the "@McDPhilly" handle. But with Help Attack! every update, except direct messages on Twitter, triggers a donation. This is great for nonprofits as more updates means more money. There are two potential cause marketing angles to Help Attack!. Say that Dell Computers agreed to pledge $250,000 for employee that signed up for Help Attack! and tweeted and Facebooked for good causes. Help Attack! would become another way for Dell to motivate employees, especially those who enjoy a vibrant online life, to help causes. Another valuable asset of Help Attack! is data mining of social information. David used the McDonald's program in Philadelphia on Foursquare and Twitter to illustrate his point. To qualify for a $1 donation to the Ronald McDonald House Charities, Foursquare check-ins have to be forwarded to Twitter and include the handle "@McDPhilly." If you're not on Foursquare this might sound complicated, but it's not. It's also a clever way to measure the success of the campaign. But as David points out, involving Help Attack! takes the program beyond vote-counting and turns this social information into useful and actionable data. The next step for Help Attack! may be to convince companies to pledge on behalf of their customers. After they register at Help Attack! consumers would enjoy company backed donations to their favorite causes for one, two or four weeks. The bounce-back benefit to the company--in addition to increased favorability with stakeholders--is the social data. This isn't about companies delving into personal information on consumers (heck, they already have that). What they want to know more about are preferences, attitudes, perceptions and habits. And social is another data point. Help Attack! is for causes but companies will benefit from the fight.